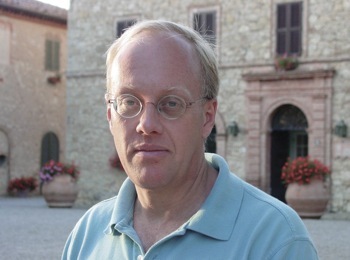 By clicking here, you can see Chris Hedges deliver his speech (transcript below) in a video made by Leigha Cohen. The address was inspired in part by a short essay on Facebook by Naomi Wolf. God's covenant in the Promised Land was not made with those who pilot F-16 fighter jets that drop 1,000-pound iron fragmentation bombs over the concrete hovels of Gaza. It was not made with those operating Apache or Cobra attack helicopters that unleash lethal fire over crowded refugee camps. It was not made with drone operators that clinically kill children ... outside mosques. It was not made with M-60 tank units and artillery crews that murder families huddled in terror in their homes. It was not made with those on gunboats that slaughter boys playing on a beach. It was not made with those that fire Sidewinder missiles and drop 250-pound "smart bombs" on apartment blocks. It was not made with snipers from the Golani Brigade that gun down unarmed men and women for sport. It was not made with occupiers that reduce an entire people to a starvation diet -- indeed count the calories to keep them barely alive -- or to those who use words like "mowing the lawn" to justify the indiscriminant slaughter of innocents. God's covenant in the Promised Land was not made with politicians -- including every member of the U.S. Senate -- that mouth words for peace and perpetuate war, that call for justice and perpetuate injustice, that refuse to stand up for the rule of law and the right of a captive people to be free. God's covenant in the Promised Land was not made, finally, with any race or religion. It was not made with the Jews. It was not made with the Muslims. It was not made with the Christians. God's covenant -- in the Bible and the Koran -- was made with the righteous. When Ibrahim asked in the holy Koran if the covenant could be inherited, he was told bluntly: "My covenant is not given to oppressors." And God's iron requirement to stand with the oppressed occurs as well in the Hebrew and Greek bibles. Those who turn away from righteousness -- be they Jew, Christian or Muslim -- violate that covenant. They are not God's people. God's covenant is made with those who love mercy and do justice, with those who care for the stranger, the orphan and the widow, with those who frustrate the ways of the wicked, with those who bring good news to the oppressed, who bind up the brokenhearted, who proclaim liberty to the captives and release to all those in prison, including those imprisoned in Gaza. God's covenant is with those men and women -- Jews, Christians and Muslims, believers and nonbelievers -- who say, "Let my people go, oppressed so hard they could not stand. Let my people go." And God calls these people oaks of righteousness. And they are God's people. Why does God weep in the Promised Land? God weeps because families, huddled in terror in their homes, are dismembered and killed by Israeli bombs. God weeps because mothers howl in grief over the bodies of their children in U.N. schools hit by Israeli shells. God weeps because the old and disabled, who could not flee the deadly Israeli advance, died helpless and afraid. God weeps because the powerful, here and in Israel, lie and dissemble to justify murder. And God weeps for all those who stand by and do nothing. God weeps because the assault on Gaza is not about Israel's right to self-defense or about removing Hamas from power. It is not about achieving peace. God weeps because the assault on Gaza is about the decades-long campaign to destroy and ethnically cleanse the Palestinian people from their land. God weeps because Israel is constructing squalid, lawless and impoverished ghettos where life for Palestinians is barely sustainable. God weeps because Israel restricts or shuts off movement, food, medicine and goods to accentuate the human misery. God weeps because Israel has turned Gaza, now largely without power, running water and sewage [systems], into a vast gulag. God weeps because the failure to condemn Israeli war crimes by our political establishment and our compliant media betrays the memory of those killed in other genocides, from the Holocaust to Cambodia to Rwanda to Bosnia. God weeps because we have failed to learn the fundamental lesson of the Holocaust, which is not that Jews are unique or eternal victims, but that when you have the capacity to stop genocide, and you do not, you are culpable. And we [Americans], who provide 95 percent of Israel's weapons, are very culpable. All tyrants fall under the weight of their own depravity. Justice does come. The captives are set free. There will be a day when the instruments of war will no longer leave our shores to be delivered into the hands of killers. Not one bullet. And those who have broken God's covenant will feel the blast of justice, the fury of the righteous who will rise up on behalf of the oppressed. Peace in the Promised Land is in our hands. It will not come from politicians here or in Jerusalem. It will not come from courts of law. It will not come from international bodies. Peace in the Promised Land will come when those who love mercy and do justice build a sustained mass movement -- as we did against the apartheid regime in South Africa -- week after week, month after month, year after year until the captives are set free. Peace in the Promised Land will come when we force, through boycotts, divestments and sanctions, the powerful to end the blockade of Gaza and deny the instruments of death to Israel. But it is up to us. We are all that stands between the Palestinians and obliteration. The road to justice will be long and hard. It will require sacrifice, including personal sacrifice. Those who worship power cling furiously to it. And they will use that power against us. Our names will be reviled. Our voices will be marginalized. Our motives will be impugned. Our character will be assaulted. Our bodies will be taxed. We will be jailed. And we will know frustration and despair. The road to justice will be long and hard. But there is no turning back, for we are no longer driven by a vision of suffering but are possessed by it. We hear the cries from Gaza. We carry these cries within us. We will not rest until there is a balm to anoint the afflicted. We will not rest until there is comfort and justice for the oppressed. 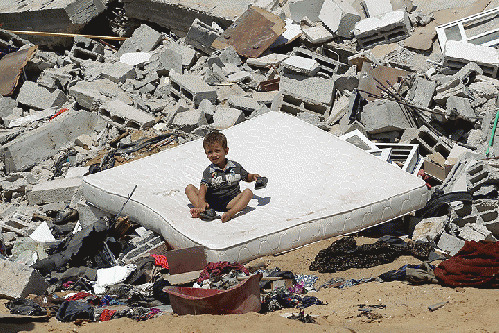 We will not rest until the children of Gaza have their childhood returned to them. We will not rest until the people of Gaza, no longer imprisoned, live in a free and independent Palestine.